A FABULOUS PLACE TO LIVE! Exclusive subdivision with over 50% green space, ponds and 2 gazebos. Lot sizes average ~1acre. Great location just north of New Albany, SR 36/37, Polaris, I-71 & Rattlesnake Golf Course! All lots back to green space. City water (tap fee not included), natural gas & electric available. Home prices range $400k and up! 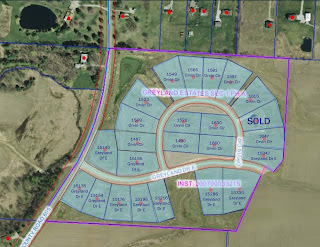 Lot sizes range from 0.793 to 1.514 acres. Bring your own builder. Deed restrictions apply. $200/year HOA fee applies. Big Walnut Schools! Lots range from mid $50’s to mid $90’s! Call DeLena today!